Win The New England Umbro Away Shirt – Competition Winners Announced! A couple of weeks ago, we gave you a sneak preview of Umbro’s new England Away Kit, which will be given its first official run-out when England play Egypt in a friendly at Wembley on March 3rd. To celebrate next month’s launch of the kit, Pies has FIVE of the new England away shirts to give to five lucky readers, courtesy of the lovely people at Umbro. Umbro’s first ever football kit was worn by which English club? Email your answer to ollie@anorak.co.uk (with ‘England Away’ in the subject field). Good luck! Terms & conditions: The closing date is Friday 26th February. Only one entry per reader. The competition is open to readers worldwide. UPDATE: So the competition closed at the end of last month. The answer? c) Man City. The lucky five winners, chosen at random, are: Anthony Abbate, Di Coke, Sam Peters, Glen Maguire and Kim Stone. Well done to you, and thanks to everyone for entering – we had more than 600 entries. Better luck next time! 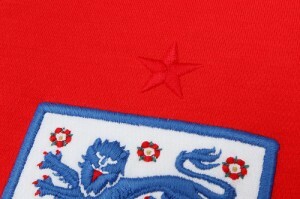 I can’t wait to see how the new kit looks, especially after the excellent job Umbro did with the current home kit. All we know at the moment is that the away shirt is red (see photo, above) and takes its visual cues from the 1966 World Cup-winning kit. “With this kit, the most interesting things were in the form, and in the components that then make up that form. We knew that different parts of the body needed different types of material. “This concept was developed totally through insight, through talking to players but also talking to experts such as Loughborough University in particular. There has been extensive amounts of research done into that field, looking at thermal conditions in different parts of the body during exercise. There are thermal maps that exist that show you what parts of the body get hotter after what length of time doing what type of exercise. So we knew that in a game of football, we had to cool down the back, we had to cool down the underarm and the upper side of the body. “There is also an understanding that the front of the garment for example can’t feel too shear or exposed, it needs to be comfortable and it can’t be too coarse, without any textural difference. “The sleeve is just logical, in that it’s the only part of the upper body that has joints that move in that way, where the amount of skin in that area of the body changes and contracts, so they already require an articulation concept in order to work with the body. So when you deconstruct that thinking into ‘the arm needs this, the back needs that, and so on’, it seems really obvious, but no one has really thought that directly about it before. It’s not just that we wanted to make a shirt out of three fabrics and make that the front, the back and the sleeve, it was also about making those elements work together, which is what is really fresh about this kit. It’s really considered as a whole. “It’s a piece of really modern, technological kit, but embedded in this idea of style and tailoring. With the away kit, we wanted to balance out those two factors – we wanted it to be as much about performance as it is about style. That’s a really complicated thing to achieve, getting that balance right. So we’ve tried to talk about simplicity and craftsmanship and even minimalism, whilst actually making one of the most unconventional constructions that we’ve ever seen in a football kit. That would normally negate a connection to minimalism, but we’ve somehow achieved it. “We discovered that Alf Ramsey was actually involved in the design of the ’66 shirt, in that he asked Umbro to design a shirt without a shoulder seam. So the front and back panel is just one piece. To think that that’s something so forward thinking and revolutionary, yet it creates something so timeless and pure, – that was a huge inspiration for us. It’s got a revolutionary role that nobody knows about, because they didn’t need to know. “We wanted to make this shirt as comfortable as possible. It’s only about ’66 in a visual context, it’s really more about the new design language that we’re inventing. For instance, the collar on the ’66 shirt was a high crew neck, which was quite uncomfortable. If you look at this shirt, from the side, it’s actually higher at the back than the front, so it ventilates much more easily and is much more comfortable. I didn’t know that about Alf Ramsey and the ’66 kit. Interesting that a manager would take such an active interest in the design of a kit. I guess that’s what set Ramsey apart from most other gaffers – his attention to detail. 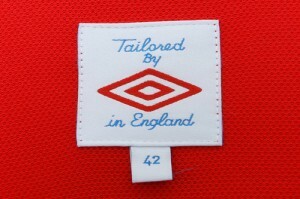 For more updates on the England Away Kit, and other cool shizzle, check out Umbro’s blog.